I know some people who turn their noses up to the idea of meatloaf. Maybe it reminds them of something that their mother ought not have made. Or maybe it reminds them of styrofoam lunch trays and brown gravy that came from a can. Whatever preconceptions you may have concerning meatloaf, put them aside, for tonight we dine humbly and dignified. This dish may not be the prettiest, or “in vogue” but there is dignity in the most Ferial of cooking. Here is a quote that further illustrates what I mean. 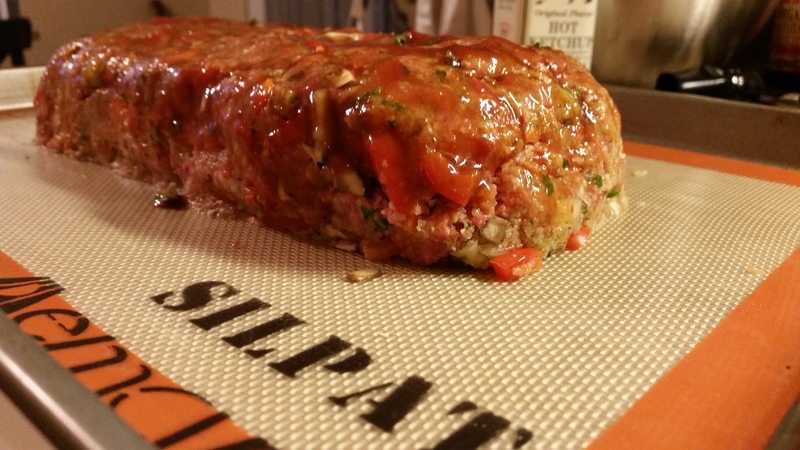 Without further ado, I give you Meatloaf. Preheat oven to 375. Prepare a sheet pan with parchment paper or a silpat. Chop celery, carrots, onion and parsley and place in blender or food processor. pulse until pieces are small. If you don’t have either of those tools, a fine dice (brunoise) will suffice. In a large bowl, combine your meat, veggies and all other ingredients. I suggest using your hands to mix, because it give you a better feel for when to stop mixing. If that freaks you out, use a big spoon. After your mixture is homogeneous, pour onto your sheet tray and make a free form loaf, try to make it as uniform as possible for even cooking. Brush a light layer of Ketchup up on all sides, and cover loosely with foil. halfway through baking, brush on another layer of ketchup and continue baking uncovered. Bake for an hour or until internal temp reaches 165. Let it rest for 10-15 minutes and dig in! We ate this with a big marinated kale salad and a sweet potato and parsnip mash. It. was. Delish. As soon as I saw meatloaf I knew it was going to be connected to the Supper of the Lamb! Great blog! And I love the new look! I LOVE MEATLOAF — need to work on your father-in-law so I can make it. 🙂 Sounds delicious! Thanks Annie! I really think he would have a hard time NOT liking this meatloaf. I have not had it in years, and the other night it felt like I had re-discovered a long lost friend.